Guyana’s National Assembly consists of 65 elected members. A majority of those members is 33, declared Chief Justice (CJ) Roxane George yesterday as she decreed the no-confidence motion passed in the National Assembly on December 21, 2018, is valid. The highly anticipated judgment which was delivered at noon drew crowds of spectators, lawyers, and media personnel to the halls of the Supreme Court of Judicature. Despite declaring that expelled Alliance For Change (AFC) Parliamentarian Charrandass Persaud, who voted in favour of the no-confidence motion against the Coalition Government, is not qualified for elections as a member of the National Assembly on the basis of dual citizenship by virtue of his allegiance to Canada, a foreign power, the CJ ruled that his dual citizenship does not invalidate the no-confidence motion. The judge was responding to declarations sought by private citizen, Compton Reid, who had asked the court to set aside the no-confidence motion on the ground that Persaud holds dual citizenship—being that he is a citizen of both Guyana and Canada. Detailing the reasons for her findings, Chief Justice George said that there was evidence before the court to support that Persaud was born in Berbice and is the holder of a Guyana Passport. She said that there is also evidence that Persaud is the holder of a Canadian passport, which he used to travel from time to time. She declared Persaud is not qualified for election as a member of the National Assembly, in accordance to Article 155 of the Constitution, by virtue of his own act and acknowledgement of allegiance, obedience and adherence to a foreign power to wit, the Sovereign State of Canada. The Chief Justice added that there was no evidence before the court that Persaud renounced any of the citizenships. Justice George noted that Articles 53 and 155 of the Constitution of Guyana speaks to the qualifications and disqualifications for election as a Member of the National Assembly. The CJ declared therefore that the former AFC Parliamentarian was on April 07, 2015 disqualified from being nominated as a member of the National Assembly of the Republic of Guyana. The Chief Justice made it clear that by swearing allegiance to another state, a dual citizen is not eligible to be elected to serve in the National Assembly. She stressed that this is applicable to other Members of Parliaments holding dual citizenship in the National Assembly. In her determination on the question of the majority vote, Justice George held that 33 will always be the majority of 65. “If 65 members are present, a majority of all elected members of the National Assembly would still be 33,” the Chief Justice said, as she outlined reasons for asserting that the no-confidence motion was carried. Against this backdrop, she noted that if Persaud had voted against the no-confidence motion, the government would have accepted that the vote count of 33 is the majority of all elected members. She added if there are less than 33 members present in the National Assembly, no Bill or Motion can be passed. Accordingly, Justice George noted that the order of Speaker of the National Assembly Dr. Barton Scotland – that the No Confidence Motion, Resolution No.101 was passed by the National Assembly – is legally binding. “A majority of all elected members of the National Assembly is at least 33 members,” reiterated the Chief Justice. Following the passage of the No-Confidence Motion, the Government, through Attorney General Basil Williams, had contended that it was not defeated. The Government, which named Scotland and Leader of the Opposition Bharrat Jagdeo as Respondents in its application, moved to the court for a determination of several issues, one being that, 34 or more votes were required for the passage of the no-confidence motion. The government had also contended that the failure to obtain such votes breached Article 106(6) of the Constitution and was unlawful and the certification by the Speaker by issuing Resolution 101 could not be conclusive. Thus, Justice George declared, “the ruling of the Speaker that the no-confidence motion debated in the National Assembly on December 21, 2018, is carried by a vote of a majority of all elected members of the National Assembly is lawful and valid, being in accordance with the Constitution of Guyana”. Moreover, in arriving at resolution to the majority issue, Justice George referenced case law from the Eastern Caribbean Supreme Court and Trinidad and Tobago. Further, she specified that though Persaud was not qualified for elections as a Member of Parliament due to him being a citizen of Guyana and Canada, his “yes” vote on the no-confidence motion against the government is valid. In this regard, the High Court Judge said that there is no evidence before the court to show that Persaud knew that he was not qualified to be an elected member of the National Assembly. On the other hand, the Chief Justice ruled that the court did not have the jurisdiction to determine a number of other issues highlighted in Reid’s application. Those matters, she pointed out, would have been dealt with by way of an Elections Petition filed within 28 days after the elections were held. In relation to another application filed by Chartered Accountant and Attorney-at-law, Christopher Ram, the CJ ruled that by virtue of the no confidence vote, the Cabinet, a sub division of the government has been nullified. The government nonetheless will remain in place until an election is held and a new government is installed. 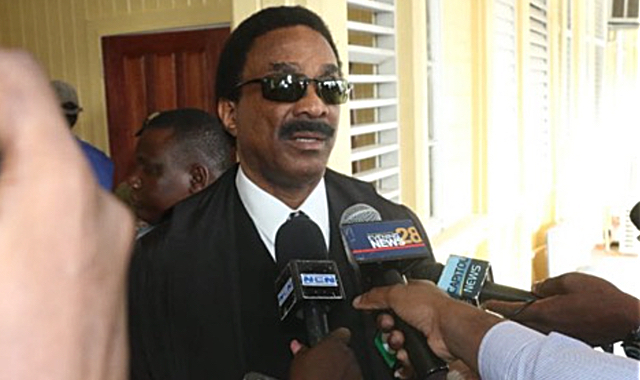 Subsequent to the ruling, Attorney General Basil Williams made an application for a stay of the judgment and a Conservatory Order for the government to remain in office until appeals are heard by the Caribbean Court of Justice. In response, Nandlall noted that the ruling is in essence the court’s interpretation of the Constitution. He stressed therefore that there is no basis for the application. His objections were proffered on the grounds that “the Chief Justice merely answered questions that were put to her… it is the Court‘s interpretation of the simple language of the Constitution. Further, Chief Justice George explained that Williams’ request for a stay and conservatory order is useless at this time, given that she could not grant a stay of the Court’s clarification of a decision taken by the parliament. The CJ advised the Attorney General that the appropriate redress at this juncture would be to appeal the Court’s ruling. “A lot of work has been done in those matters, but they have settled matters of vital national importance and hopefully now the way has been cleared for the constitutional provisions to be complied with. Those provisions are that election should be held within the stipulated time frame. Additionally in relation to the decision on the legality of Cabinet, Nandlall told the media that he is unbothered by the AG‘s intent to file appeal.